Dichorisandra thyrsiflora or ‘Blue Ginger’ plants. With stunning blue flowers this native of the tropical rain-forests of Central and South America has wonderful green foliage topped by brilliant blue flowers in late summer. 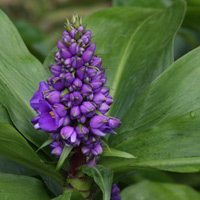 Dichorisandra thyrsiflora or ‘Blue Ginger’ requires a moist well drained soil and some protection from frosts is ideal. Other than this little care is required. It grows best in warmer climates however with protection it will grow as far south as Melbourne and in these colder climates it will die right back during winter. Best suited to warm climates Dichorisandra thyrsiflora or ‘Blue Ginger’ will reach 1m. In cooler climates try growing Blue ginger in a container where it can be given some protection during winter months and moved to a warm humid position during the growing season. Flowers are often picked for indoors, remember that stems are brittle and easy to break. Easy from division as Dichorisandra thyrsiflora spreads by underground runners. Clumps can easily be divided during winter. Plants can also be propagated from cuttings. This is a plant that was regarded as rare, however it is increasingly available at nurseries.